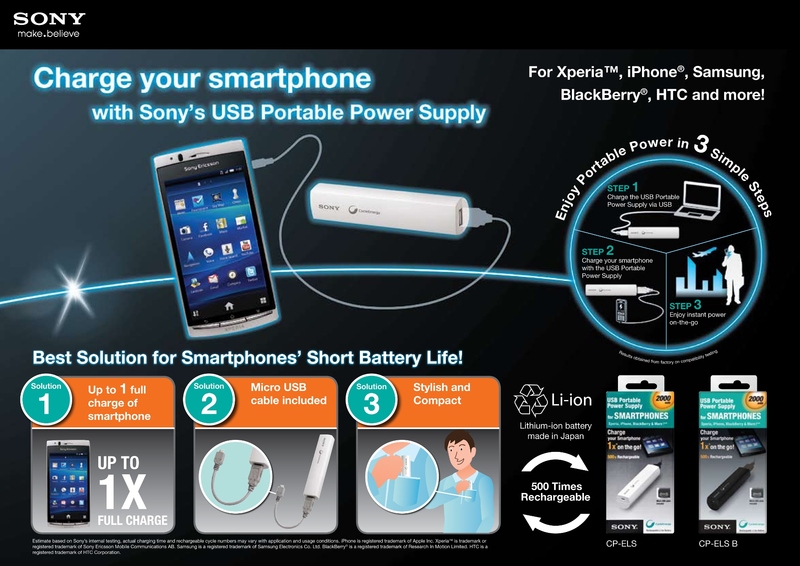 The Sony CP-ELS USB Portable Power Supply will be launching today at IT Show 2012 (8-11 March 2012 at Suntec Singapore). It will be retailing for S$29.90 and it will be available in 2 colors (black or white). It has a battery capacity of 2,000 mAh and only weights 87g. According to my brother, it can charge Blackberry 9900 (not many portable battery chargers can do that). There are 2 USB ports, one on each end of the Sony CP-ELS. On one end is the Micro USB Port which it used to charge itself and on the other end is the normal-sizezd USB Port which is used per normal to charge mobile devices. 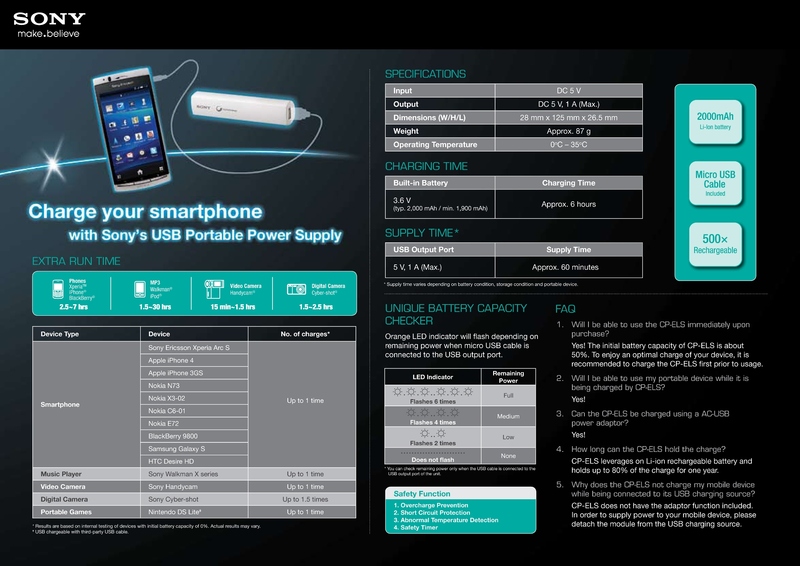 If you are using the bigger Galaxy Note (2,500mAh), it will only charge till about 80% full. Technically you can use it to charge bigger gadgets like tablets (Apple iPads and Samsung Galaxy Tabs) but since the max output is only 1A, charging those devices might take slighly longer than usual. 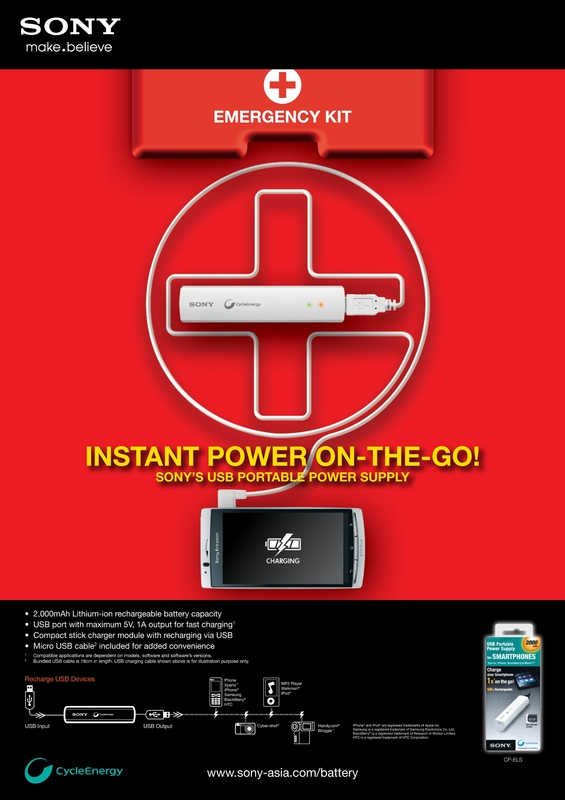 Thanks to Sony, I will be giving out a pair (1x white and 1x black Sony CP-ELS USB Portable Power Supply) worth S$59.80 (2x $29.90) to 3 lucky winners. Tweet about the moment you wish that you have #InstantPower with you. Ensure that your tweet contains #InstantPower (giveaway hashtag) and http://lc.sg/1io (link to this blog post). Be as creative and original as possible as entries will be judged based on these 2 criteria. Li Xiang and I will be the judges for this contest, entries will be judged based on creativity and originality. Winners will be announced by 23rd March 2012 and contacted via Twitter. Sony will be sending the prizes to the winner directly. Details of winners such as name and winning tweet will be posted on lesterchan.net. I reserves the right to amend these terms and conditions at anytime without prior notice. This giveaway ends on 11:59pm (23:59), Sunday, 18th March 2012 (GMT+8 Singapore Time). SONY USB Portable Power Supply | Random musings of a random girl. This page is generated on 18th April 2019, 15:24:22 (UTC) in 0.263s with 21 queries using 4.0 MiB of memory.